Take a second look. It's not every day that you'll come across a car quite like this. 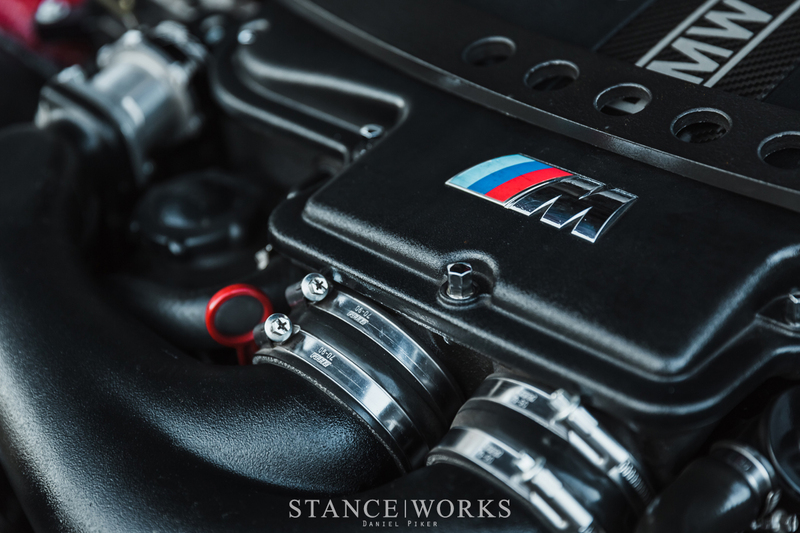 Its intricacies and details run deep, to its core, and the effort instilled within it parallels the efforts of the biggest BMW tuning houses in the world. In fact, it's a car BMW might have built themselves, if they were only crazy enough. Scott Johnson is no stranger to impressive cars and builds; his old firehouse-turned home shop space is packed to the gills with incredible machines. 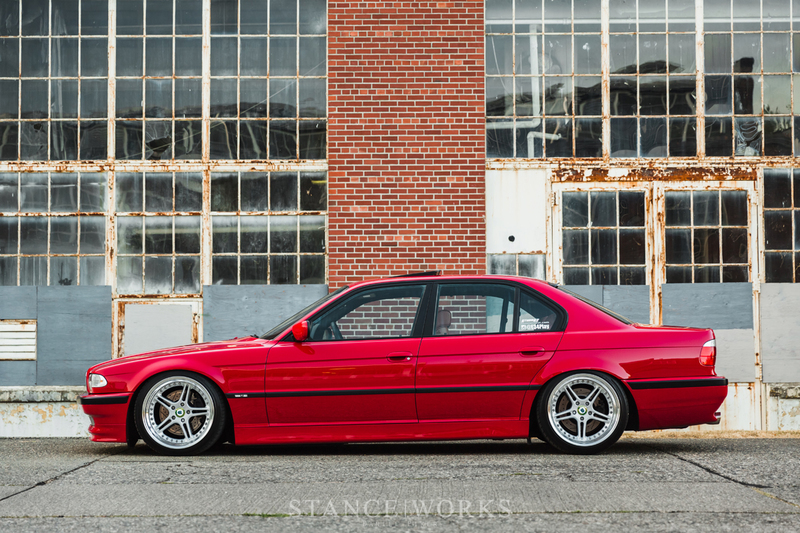 A mid-swap S62-powered E30, an E34 M5 restoration project, and a supercharged E34 540i/6 all have space of their own. It's his 7, though, that captured my attention. I asked for the story, interested in hearing what went into perhaps the sportiest big-body BMW out there. It didn't take long, though, before Scott's story unravelled into an incredible story of the pursuit of perfection. 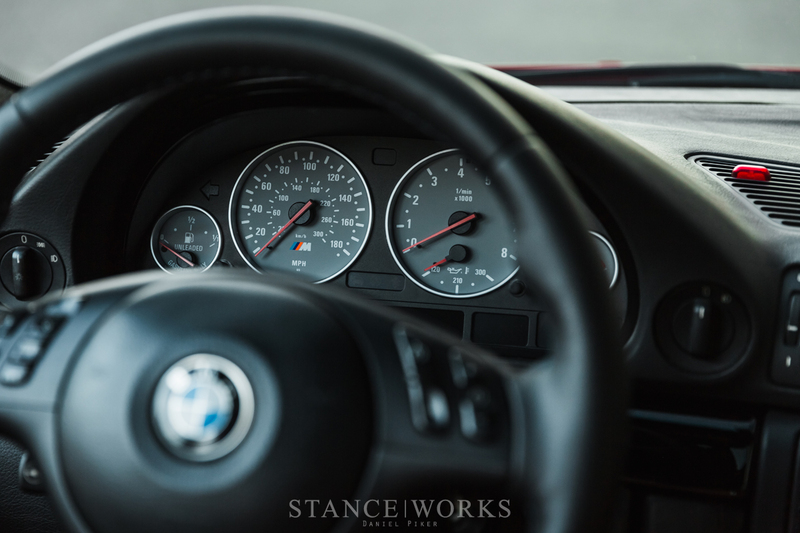 Scott's passion for the BMW marque is easy to source: his father once owned a Callaway turbo E21, an E28 M5, and then an E30 325iX that Scott learned to drive in. The apple never falls far from the tree. For Scott, though, it wasn't always about a profound love for BMWs. Instead, it all began with a Z. "When I was 12 years old," Scott says, "I used to pass by this Datsun on the side of the road on the way to school every day. It never moved and was covered in dirt, but it had a look that I obsessed over - It was a ’72 240z." Scott was captivated by the sporty Japanese fastback coupe, and found himself absorbing all of the knowledge he could find on the S30 chassis. After a year of passing by the car, Scott knocked on doors until he found the owner. With a loan from his parents, he purchased his first Z at just 13 years old, for the low sum of only $300. 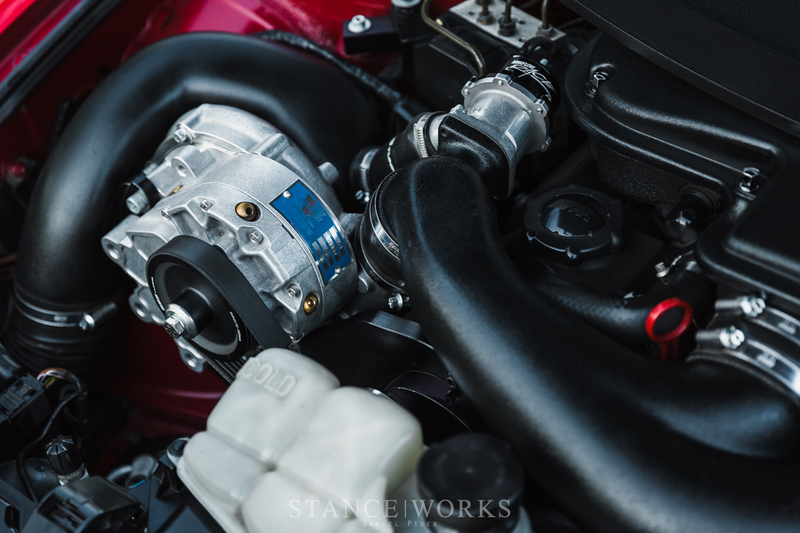 It was on that platform that Scott learned to work on cars, and after getting it running, he sold it for a profit, and upgraded to a twin-turbo Z32 300ZX, which he still owns to this day. Scott's love for the E38 did begin early, though. 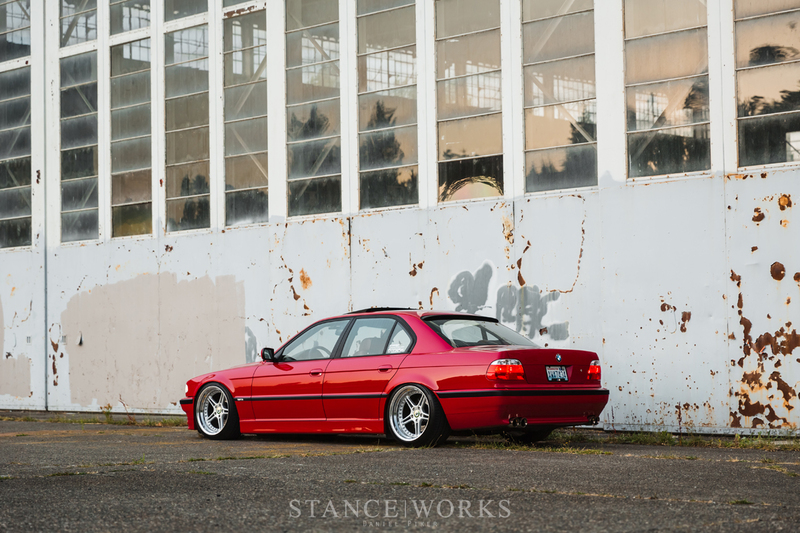 "When I learned how to drive, my mom had a ’95 740il that I remember driving now and then, and I always loved the body lines of that car and how well it drove," he tells me. That, along with a bit of childhood inspiration served from 007: Tomorrow Never Dies, meant that Scott knew some day he'd own an E38 for himself. It was only a few years ago that Scott found himself perusing Craigslist classifieds. A west-coast-wide search for desirable BMWs to fix and flip brought up your standard Craigslist findings: a lot of junk. However, a vague ad for a 2001 740i in Sacramento offered a bit of allure for Scott. No information and terrible photos left a lot to be desired, as the car was almost unidentifiable. The color and condition were completely obscured, but Scott had a hunch: one photo hinted at the car's color being red. 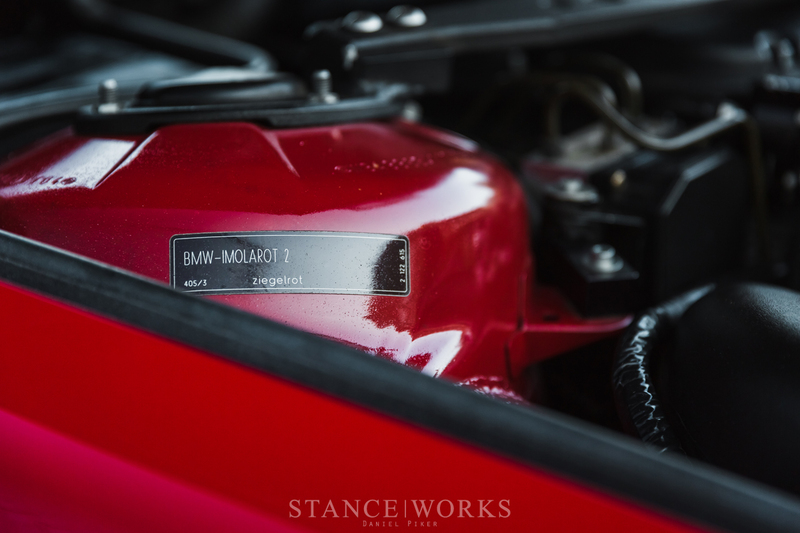 An original red E38 is a rare find, so Scott asked for the VIN and ran a check, confirming his suspicions: the car was a true original Imola Red example. As a one-owner family car, it bore signs of wear and tear, and suffered from a failing transmission, but it had never been wrecked, and again... that color. Scott paid a friend to hop on the next flight from Seattle to Sacramento to purchase the car and bring it home. 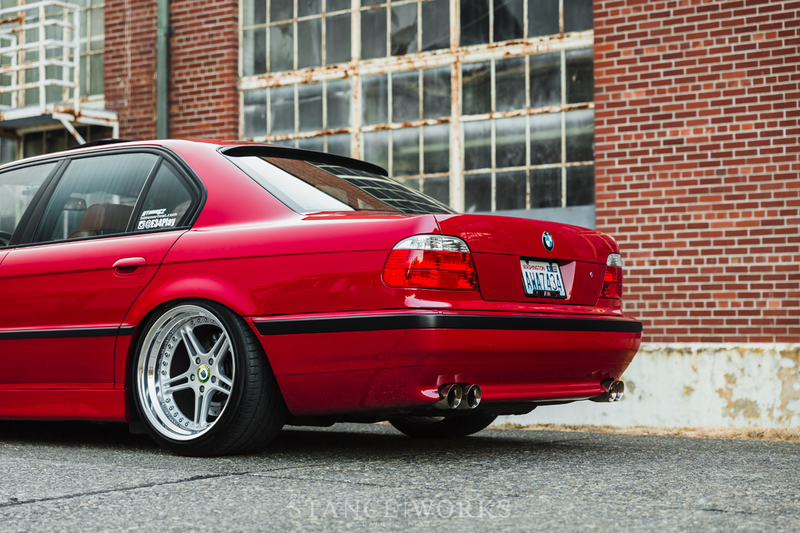 Within weeks, Scott had installed coilovers and a set of 19" BBS LM reps on the car, a quick and easy solution to making the car stand out. For a year and a half, he enjoyed his time behind the wheel of the ultimate cruiser. Of course, though, Scott's gears began to turn. As a planner, Scott began with a spreadsheet: a parts list for every specific area of the car he planned to modify, and storage bins to coincide with each list, all catalogued. He set a deadline of May, 2017, with plans to unveil his creation at Bimmerfest in Fontana, California. For six months, he planned and collected parts, leaving him just a month and a half to execute his vision. 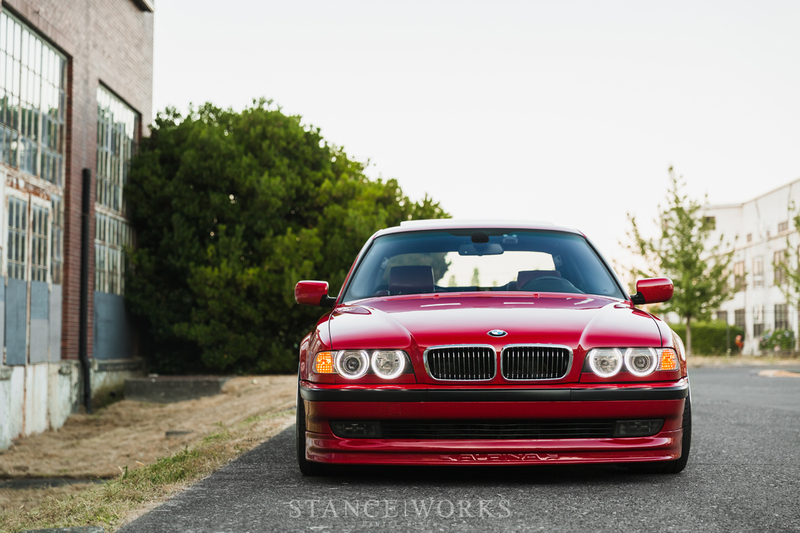 With confidence though, Scott buckled down, and began the swap of his dreams: an S62 V8 sourced from an E39 M5. Keen to up the performance of the 7 significantly, Scott put the car on the lift in order to drop the engine, as well as both the front and rear subframes. All of the old suspension and brake components were tossed in the dumpster, and the remaining parts were cleaned to perfection. 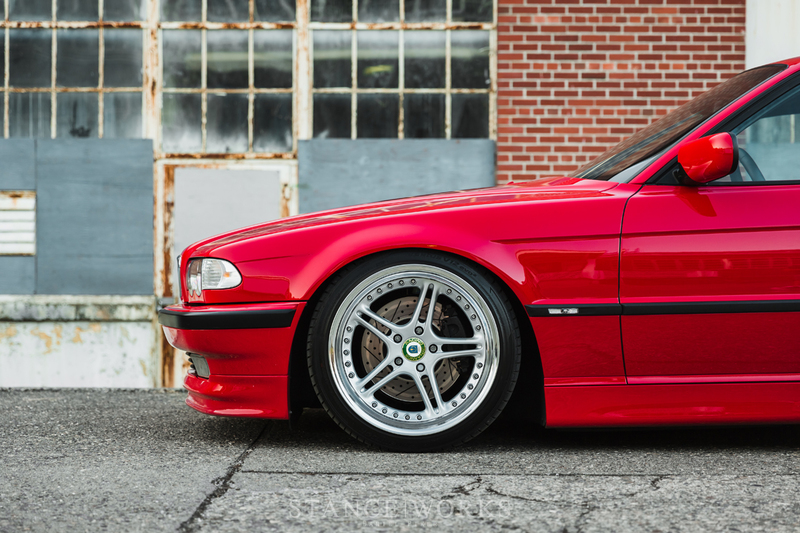 Scott fabricated mounts for the M5's LSD at the tail end of the car, and paired it with all new Powerflex bushings, Kido coilovers, new wheel bearings, hubs, lemforder control arms, and 750iL brake components. At the front of the car, similar fabrication was needed to fit the M5's steering box: not a simple task. New control arms, hubs, and bearings were used up front, and then both subframes were installed for final assembly. 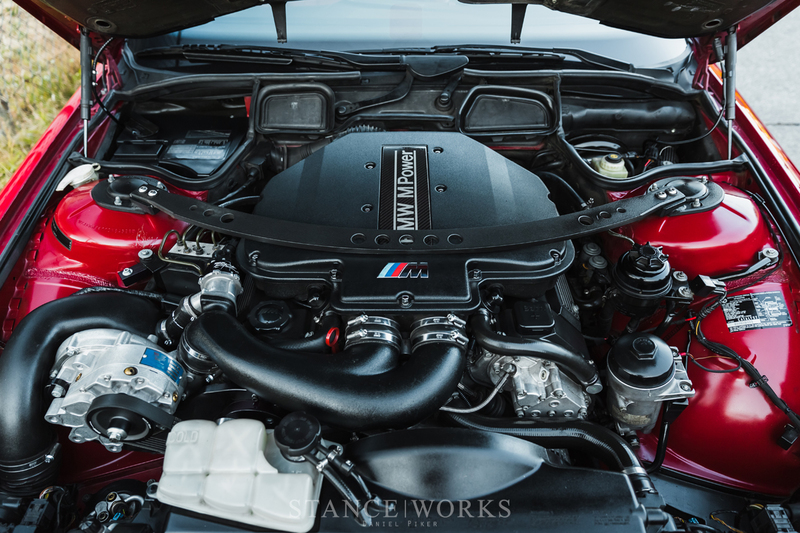 The M5's donor engine was freshened with a slew of new parts, and then dropped into the 7's bright red engine bay, backed by the M5's 6 speed transmission. The wiring was a hassle, but Scott suggests that it was the cutting and welding of the underside of the 7's hood that proved to be the biggest headache of the swap. Luckily, it was the final step. Scott was able to step back and admire the accomplishment: a swap with not a single corner cut, and no dollar spared. "Things went together so smoothly, and I was really happy with how I had prepared for the build. I ended up having the car on the road in only 3 weeks working on it by myself after work. 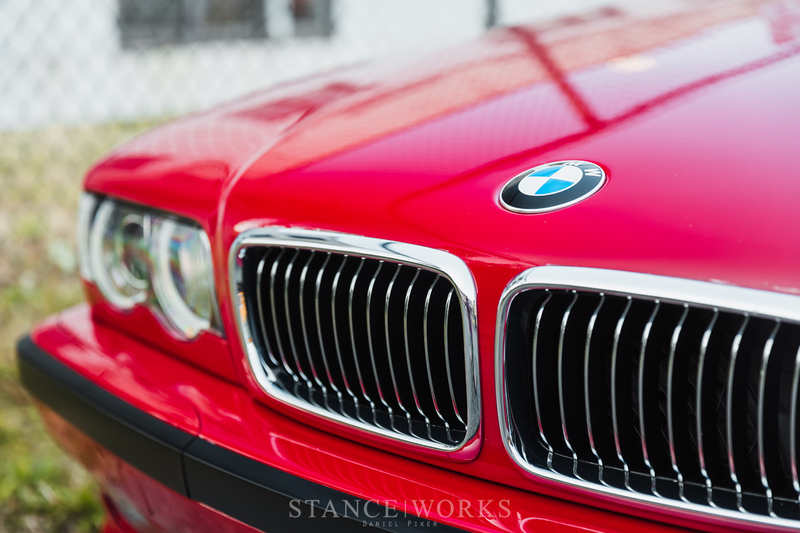 The car was barely broken in when I drove it 1200 miles down to Bimmerfest, with ZERO issues and a huge grin the entire time." It's impressive any way you cut it, and for many, that would be more than enough. 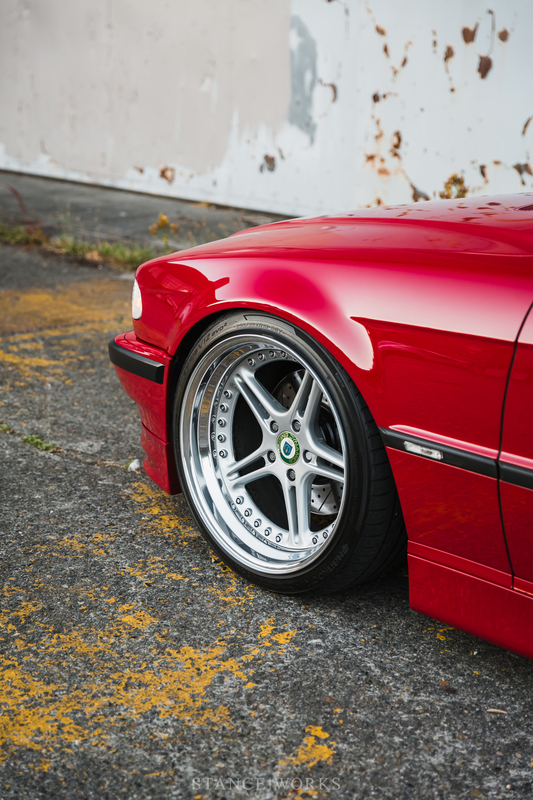 "After the car turned out to be so damn good to drive with the S62 and suspension work, I knew I owed it to the car to properly build everything else in the same way I did the drivetrain and suspension," he said, looking back upon the build following Bimmerfest '17. Again, Scott planned it out: a full repaint and exterior restoration, a custom interior, a stereo buildout, and a proper set of wheels. 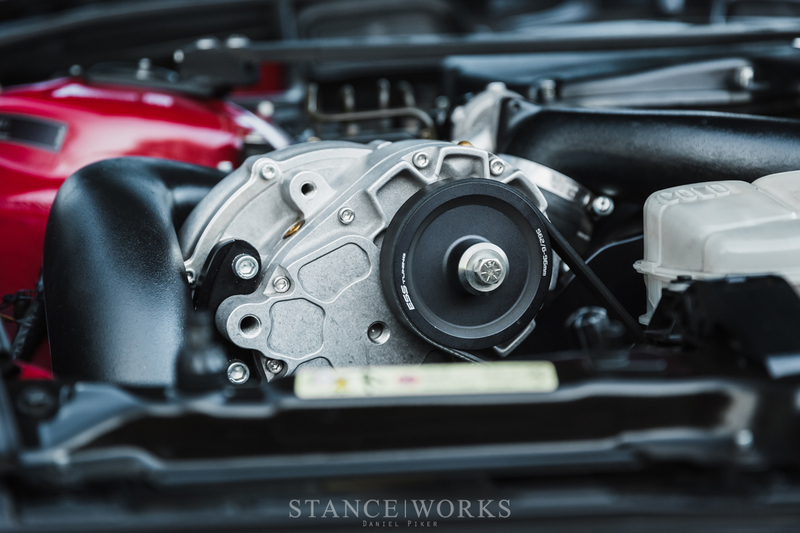 Oh, and a supercharger, too. Starting where it counts most, he installed the blower first, knocking out out in a hurry. He followed the install bys tripping down the interior and exterior, and trailered the car to paint. "The plan was to have paint finished, install the interior, install paint protection film on the exterior, install exterior trim and wheels and be finished." That was the plan, at least. With his sights set on making it to Bimmerfest 2018, the clock was ticking, but delays and hiccups at the paint shop were preventing Scott from making any real progress. 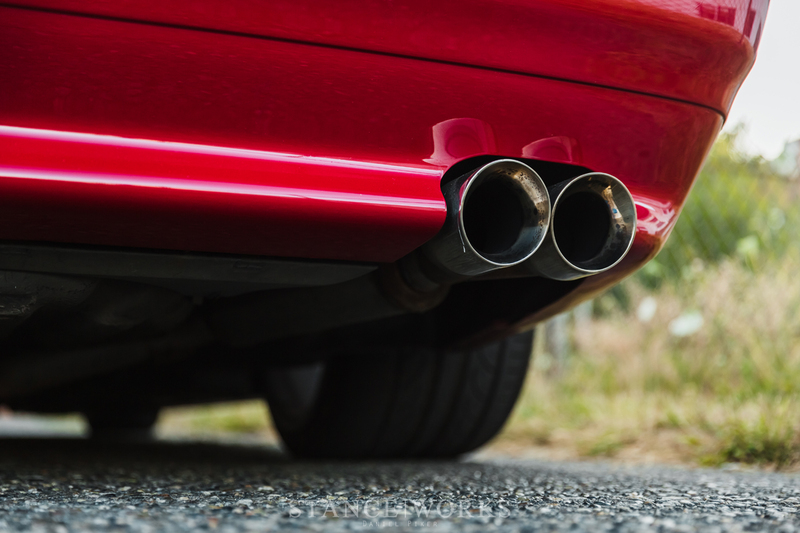 The car made continuous returns to the paint shop for blemish fixes, and as a result, PPF installation was pushed back, leaving only a small window for interior assembly and finishing once the car was back home. The interior itself is perhaps the best display of Scott's persistence. 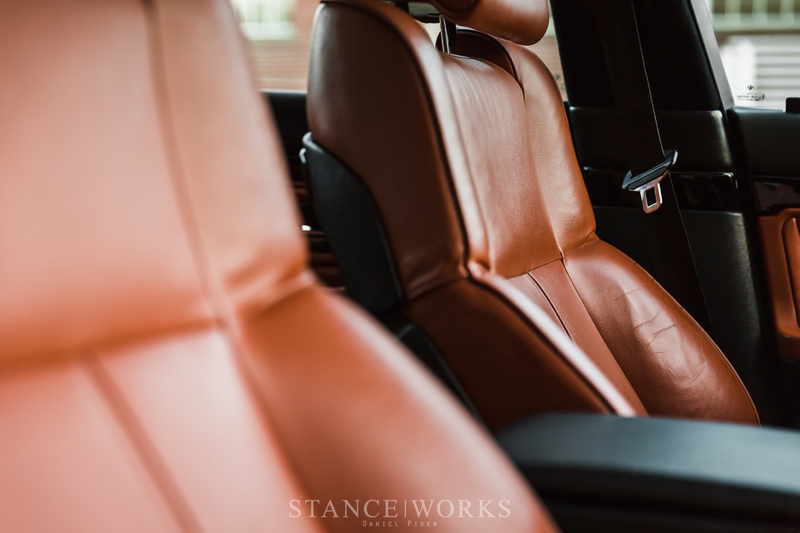 While he considered swapping to a black interior, he longed for something with more pop. 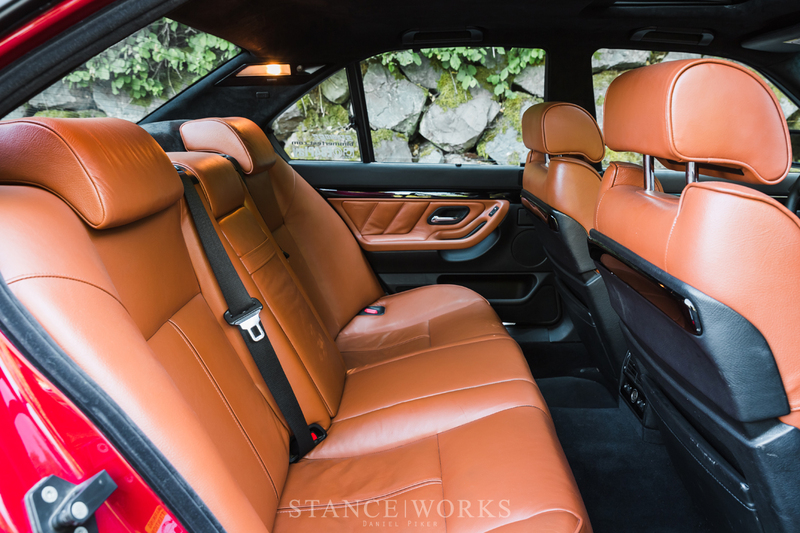 A rich saddle-tan color came to mind, and was seen by Scott as something BMW would have done themselves if the car was designed today. 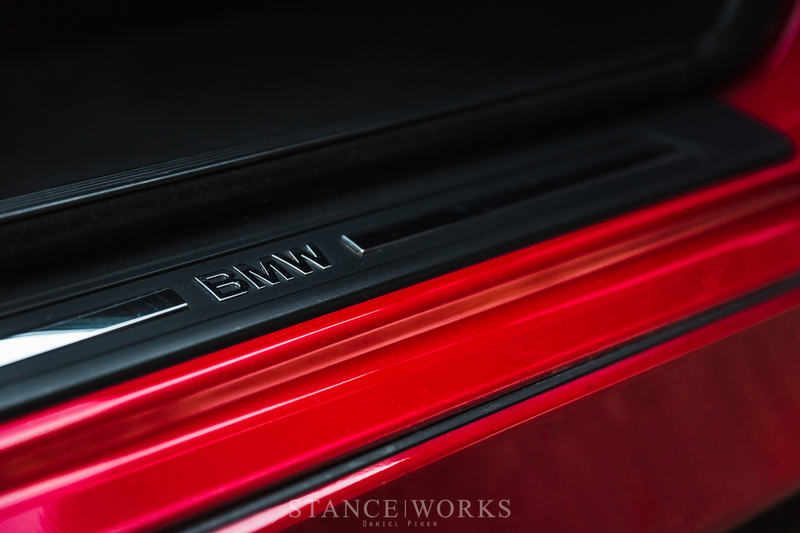 He poured through the factory leather offerings from Rolls Royce, Bentley, Audi, Ferrari, Porsche, BMW, Mercedes, and even a few others, but found himself wanting to stick with a BMW-specific color. 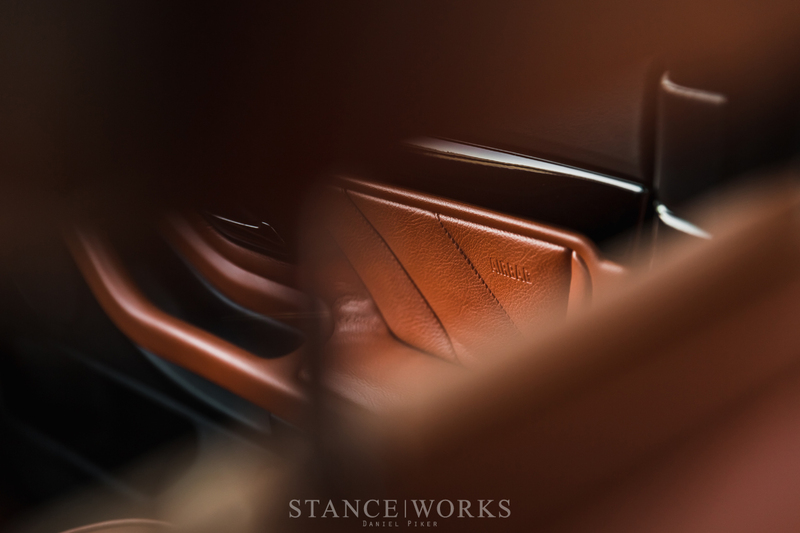 It wasn't until coming across an individual F80 M3 ordered in Ferrari Red with Golden Brown upholstery that Scott knew exactly what he wanted. 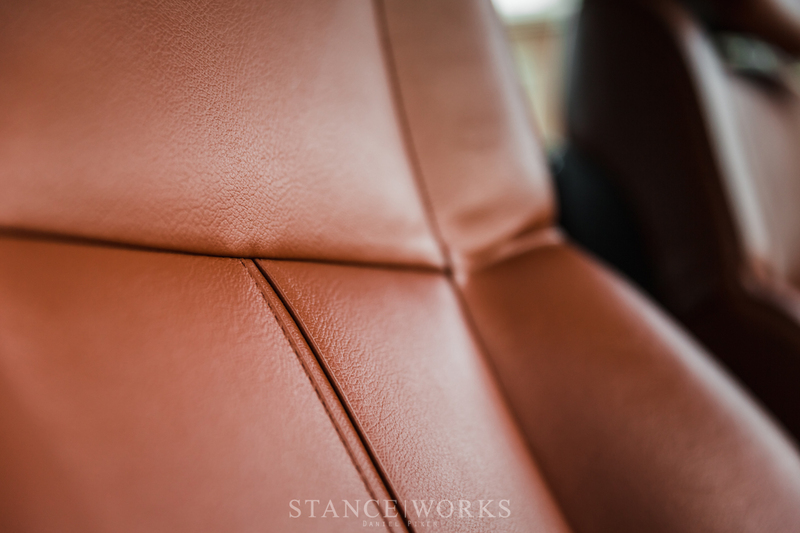 "I got the VIN # of said F80 M3, went to the BMW dealership and ordered the cheapest leather-wrapped interior piece I could find to use as a reference. 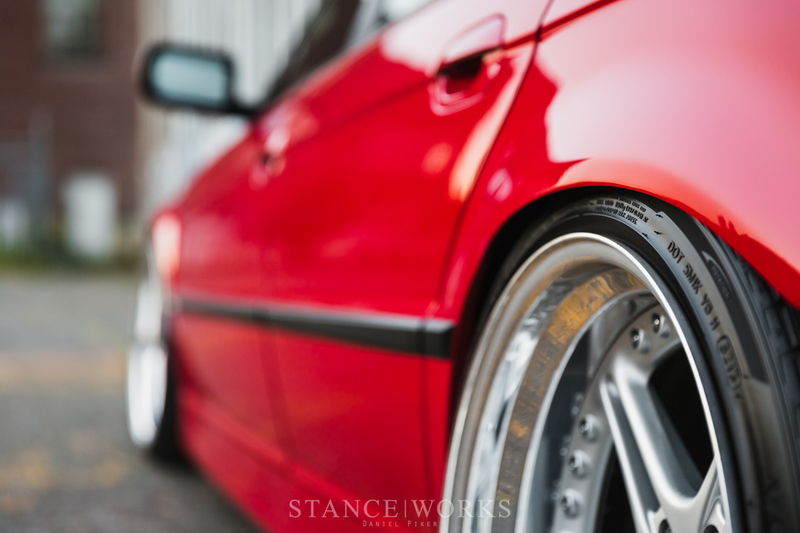 The part had to be made in Germany and showed up a few weeks later." Talk about going the distance to get what you want. Scott settled on the layout and the details, and began the hunt for all the interior components needed to pull it off. 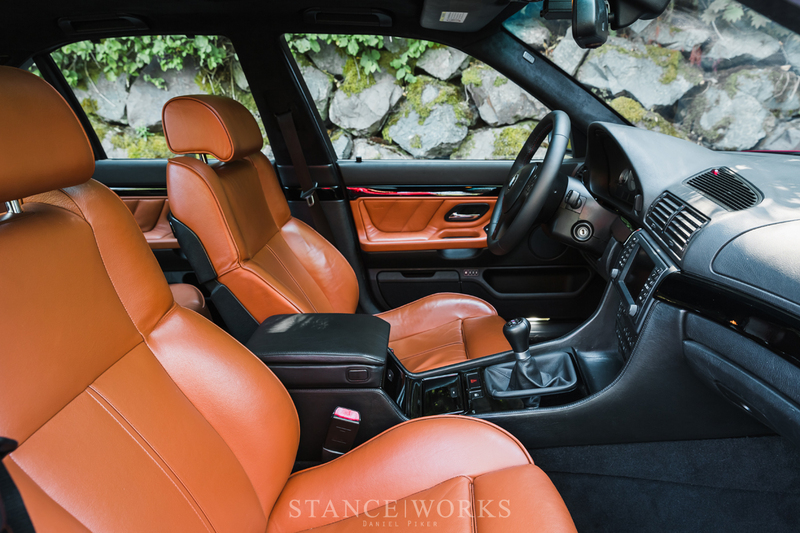 He parted out 3 different E38s just to accumulate the correct interior parts, in the condition he wanted, before having them all wrapped in BMW's Golden Brown leather. Everything returned just in time for final assembly, and the result is breathtaking. 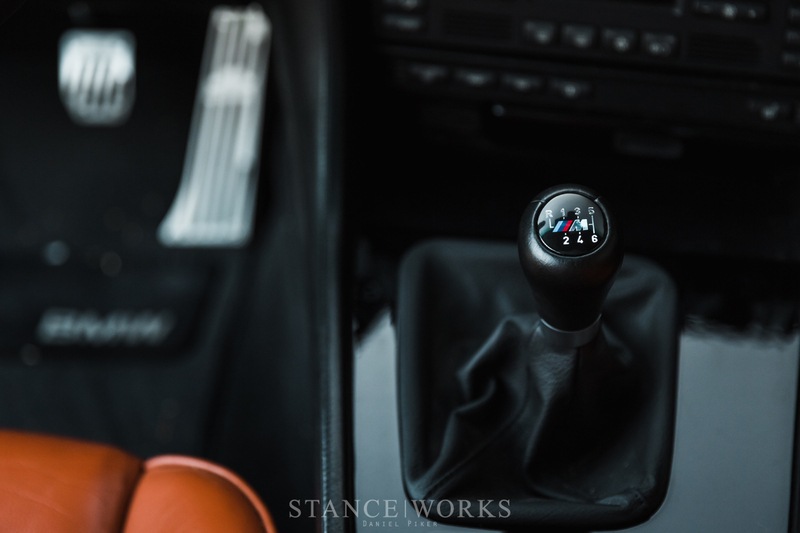 Paired with an alcantara headliner, an M5 steering wheel and cluster, and the 6-speed UUC short shift assembly periscoping up through the center console make for a sporty yet luxirious combo, just as BMW would do, no doubt. The final part of the build entailed the wheels. 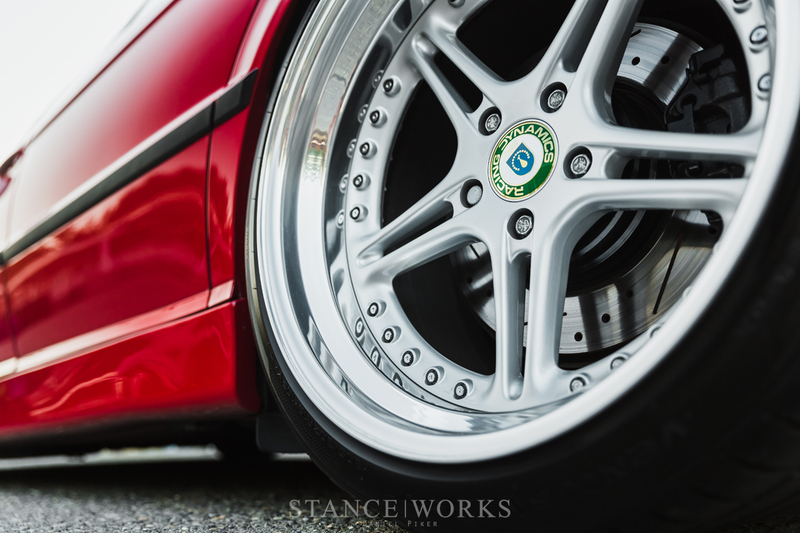 "I got really lucky with the wheels," Scott recalls. 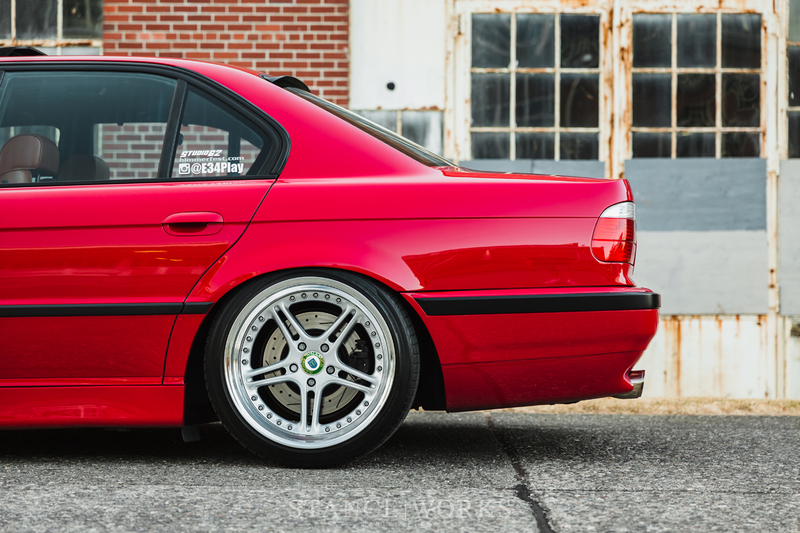 "A friend of mine posted a picture of his E60 on Facebook sporting Racing Dynamics wheels, and I joked, telling him to sell them to me." As luck would have it, his friend replied, letting him know that Mark Perrault had one new-old stock set of RS2 centers remaining. Scott sized out the desired lips and barrels, and left Mark to build the custom set specifically for the 7. The final dimensions measure out to 19x10 et10 and 19x12 et20, wrapped in 255s and 305s, respectively: a well-fitting package that blends aesthetics and performance. Top to bottom, Scott has built a 7 he can take absolute pride in. 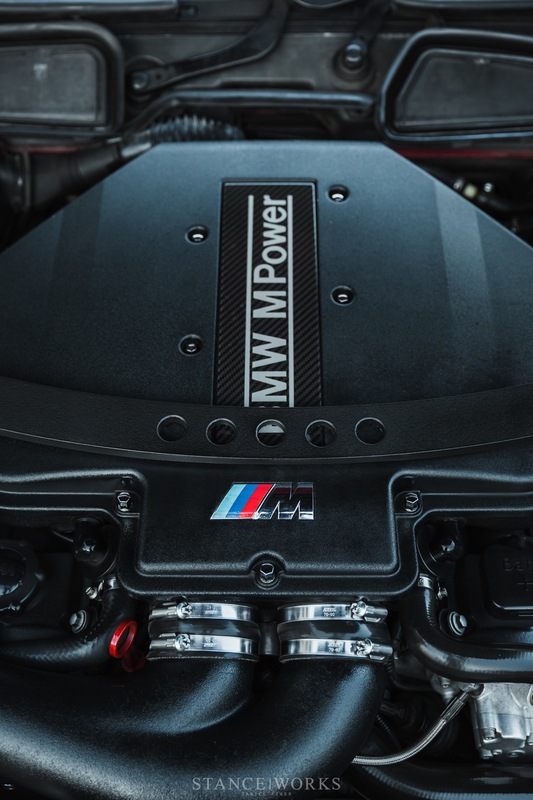 Having left no bolt unturned, he's built a custom machine fit for any use and worthy of suggesting that perhaps BMW would have built it just the same way. 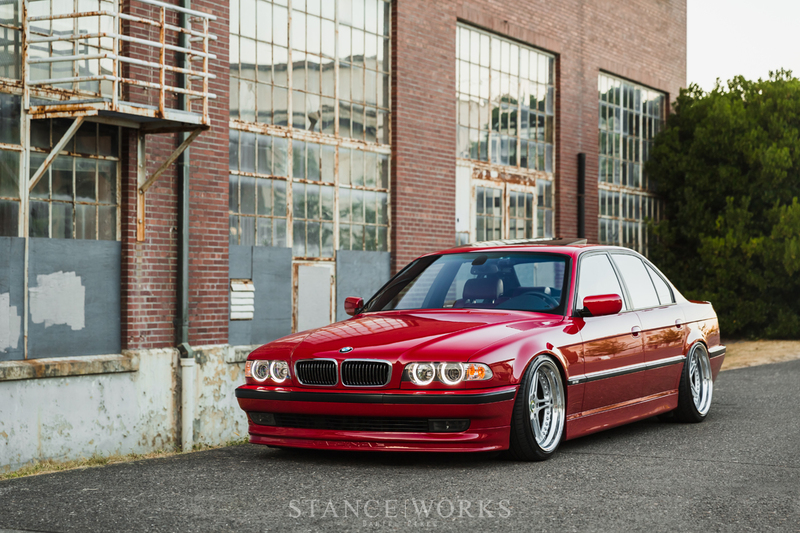 In any case, it's a 7 series that raises the bar, and will undoubtedly go on to show how timeless the E38's lines are and will be for decades to come.